I feel like I have not had the time to blog in a long time. It’s amazing how two really full, busy weeks can make a day off feel like it was ages ago, even if it was only 12 days ago. I like sitting down and writing calmly, slowly, when I have the time to choose my words and feel the inspiration bubbling towards my brain and transforming into sentences. I recently started working a second job, as a cook, in addition to the work I do at Edible Vineyard. I have an admiration for the many people on Martha’s Vineyard and elsewhere who can hold two or more jobs at once, and still feel grounded and present. It is not the easiest task to shift focus from one job to the next, especially in one day. It is even harder if you still want to take care of yourself by exercising, eating well, keeping a clean home, being there for others, and getting together with friends. It’s a lot to juggle. Even if you can get it all in, can you be present to each activity, or are you running on the treadmill worrying about work later, and at work are you wondering when you will be able to make plans with your friends? My new tactic is the following: if I am so distracted by another thought that it keeps cycling back through my mind as much as I try to push it away, I think on it, meditate on it, resolve it, even if it means I have to take a break from what I am doing. Exercise, I find, is a good time for “positive self talk”, a phrase I learned from my sister via her husband. Most of us need more of this in our lives. No better time to tell yourself, “you can do it!”, “keep going!”, “You can do anything!” than while pumping endorphins with some cardio. My busy-ness of late is what made today feel so fabulous. Thanksgiving preparation began, and there was no frantic energy around it. I did my prep-work: typed up a thanksgiving menu, printed a shopping list, printed recipes, remembered to bring shopping list and bags to the store, and a pen to cross things off (its the little stuff that makes the different in this process!). I shopped with focus, and did not let myself ponder for too long when I realized there were no cippolini onions and would the agrodolce taste as good with boiling onions? I was decisive, not always an easy task for me in the grocery store, or in general. 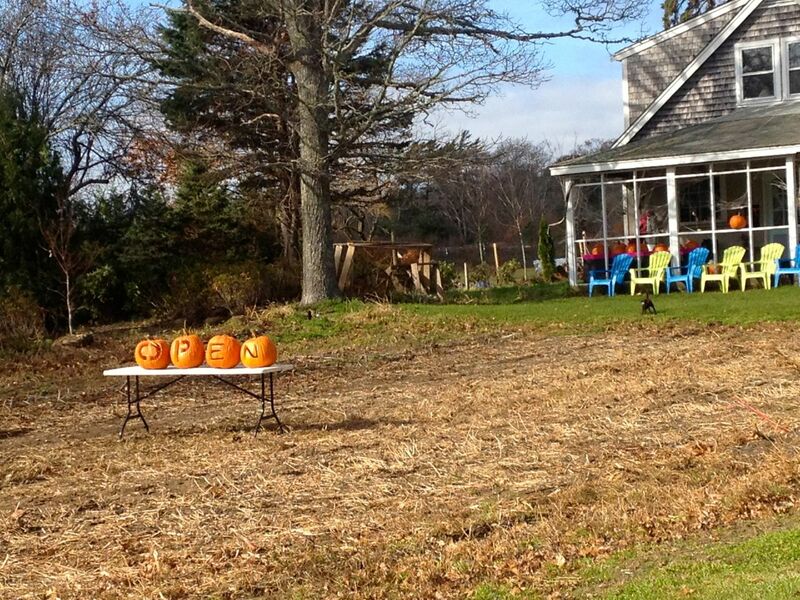 Ghost Island Farm Stand in West Tisbury, where I bought some of my produce today. Then, the cooking. I had a few projects I wanted to accomplish today, Tuesday. Being two days before Thanksgiving, I made my turkey brine so it can cool overnight, I made the filling and the dough for apple pie, and I made a big batch of granola, for breakfasts and munchies. My family is coming in tonight and tomorrow, and it’s nice to have the house filled with food that is ready to eat or easy to prepare fast. I also brewed a new batch of kombucha, but that is not for thanksgiving. The kitchen was clean, and I was the only one in it. It smelled of borscht that my dad made in the morning–beets, sauerkraut, smoky Hungarian sausage. The Pandora station was on Bebel Gilberto, and the songs were jazzy, instrumental, and beautiful, lingering vocals were easy to listen to. In other words, the music was not the kind that set the pace to my work. I set the pace, and the music kept up. Get the brine going, and start brewing the kombucha tea. 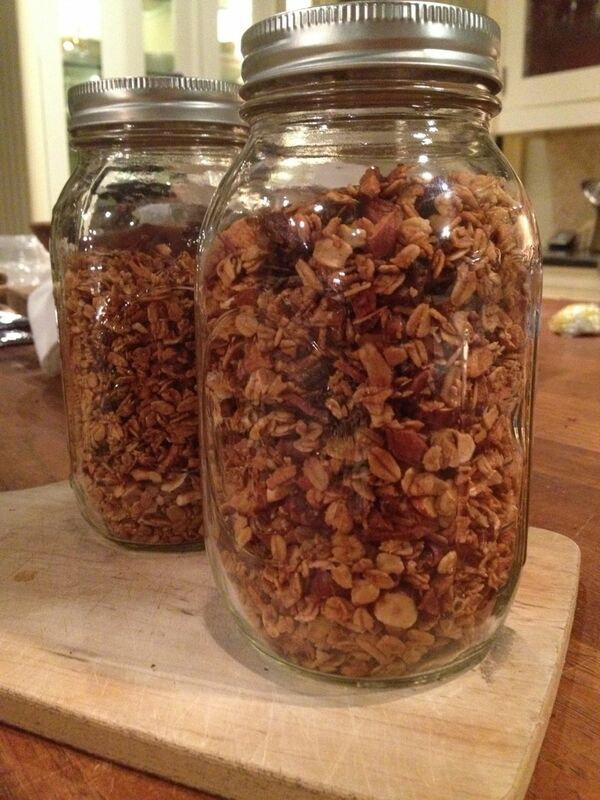 In the meantime, get the oats in the oven with syrup and butter, and prep the other granola ingredients. Moving around the kitchen, always something to do, smell, stir, taste, transfer, clean. Never a dull moment, but never a stressful one, either. No one to talk to. No one talking to me. Focusing, always, on the task at hand, because food does take focus. If you want it to come out well, there are steps and procedures to follow. Attention to detail is important. Finish one project, clean up, and start another. This rhythm can become a meditation when you know what you are doing, and you give the process the attention it demands. And then the phone rings. And it’s for me. And I say no, I can’t take the call right now. And then I feel guilty for not making time, because aren’t we expected to be there when someone calls for us, texts us, emails us? But no, I will get back to the person on the line later. Maintain focus. It’s a meditation, not a punishment. So, in short, in these days leading up to Thanksgiving, I am grateful for time. For my time. For quiet, peace and singular focus. I am grateful that, while cooking, my brain has shut up and stopped shouting incoherent messages at me. Here is the thanksgiving menu, and recipes from today. Bring all the ingredients (except ice) to a boil. Stir to dissolve the salt and sugar. Pour in the ice, and let the liquid cool. Place in the fridge or outside, and cool thoroughly overnight. I do not have exact measurements for this recipe. I did it by feel and by taste. Here are the basics. You can amend as you like, just make sure to keep tasting as you go! *I buy whole nuts, and chop them myself, not just for this recipe but in general. They taste fresher that way. Hazelnuts, especially, seem to conserve more of their flavor when they are whole. Melt some butter. Put oats in a bowl, mix with maple syrup and butter. Line a cookie sheet with tinfoil and spread the oats evenly onto it. Toast in the oven for one hour. In the meantime, chop dried apples, dates, hazelnuts and almonds. Get the pulp of the ginger using a microplane or the smallest holes on a grater. Set aside. Take the oats out of the oven and pour into a mixing bowl. 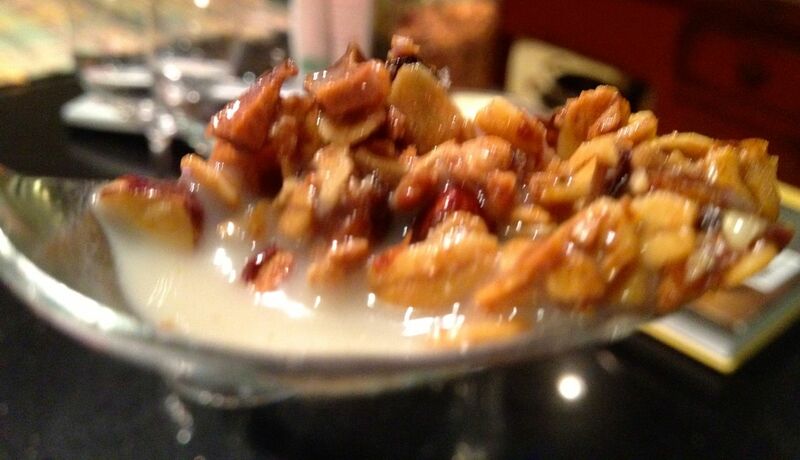 Mix in the dried fruit and nuts. 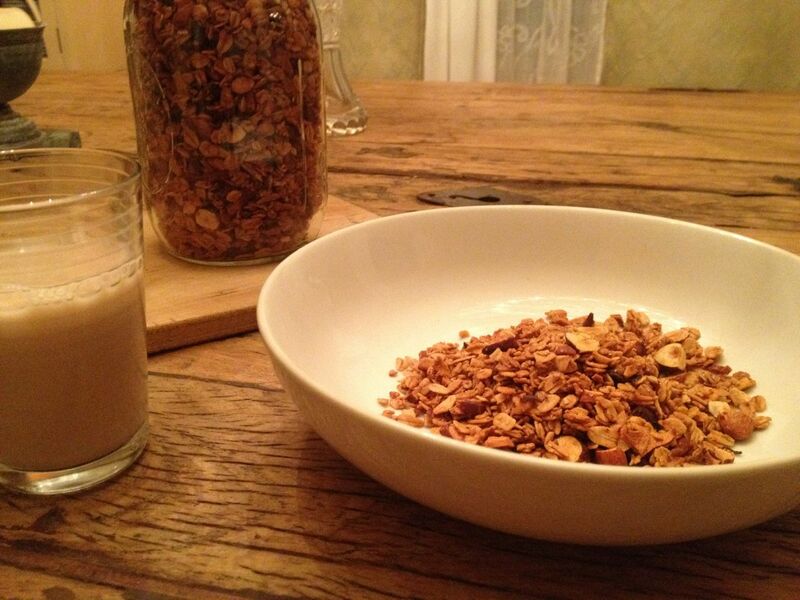 Mix the ginger pulp with more maple syrup, (quantity will depend on how much sweeter you want the granola to be). Pour over the oat mixture and mix thoroughly with a spoon to evenly coat the oats, fruit and nuts. Sprinkle in your favorite sea salt (I used Martha’s Vineyard Sea Salt), and mix again. Taste, and add more ginger and salt if needed. Some of the flavor of the ginger will subdue with baking. When you achieve desired taste, spread the mixture back onto the cookie sheet. Set a timer for 20 minutes, then check and stir the granola. Repeat this, and make sure it doesn’t get darker than you want it. After about 30-40 minutes, turn the over down to 150, and bake for another 15 minutes or so. Check frequently. Remove from oven and let cool fully before jarring it to store. It should taste sweet and salty, with just a hint of spicy ginger. Thank you, Hallie! Yes, we had a large menu, I counted 17 different dishes. It used up every surface we had when the time came to get all the food hot before bringing the bounty to the table. Somehow, we pulled it off, and the hustle stopped just as we sat down to eat…and all the food was hot! We missed you and Grant and the hold Friedman crew.